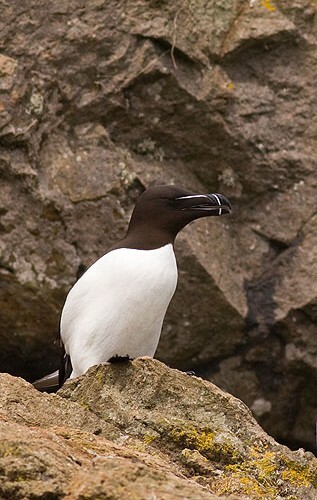 An Auk with a distinctive thick black beak which is deep and blunt / Birds only come to shore to breed , and winter in the northern Atlantic / Nests on sheltered cliff ledges or cavities . 1 oval shaped egg , May - June / 35 days incubation / 18 days fledging / winters at sea , well offshore / visiting breeding sites on calm days / Feeds on Fish, especially sandeels, sprats and herrings / diving from the surface to catch fish . Typical lifespan - 13years .